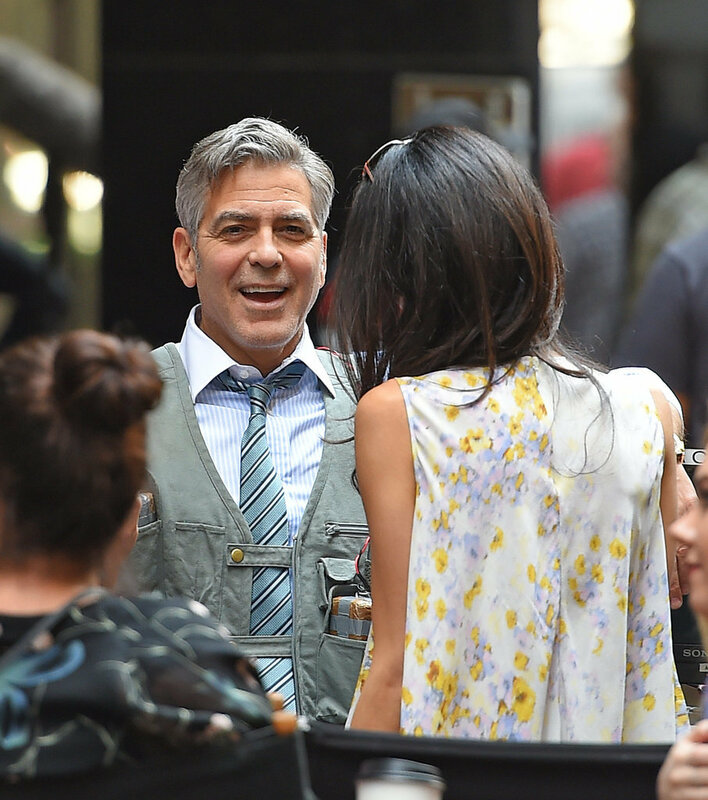 Amal Clooney was spotted (again) on the set of Money Monster yesterday. She looked perfect in this casual look. And we have the cropped jeans with big thanks to Robin for the ID ! Great ID ! thank you so much. She looks pretty and fresh. The earrings are gorgeous. She really knows how to wear statement earrings. 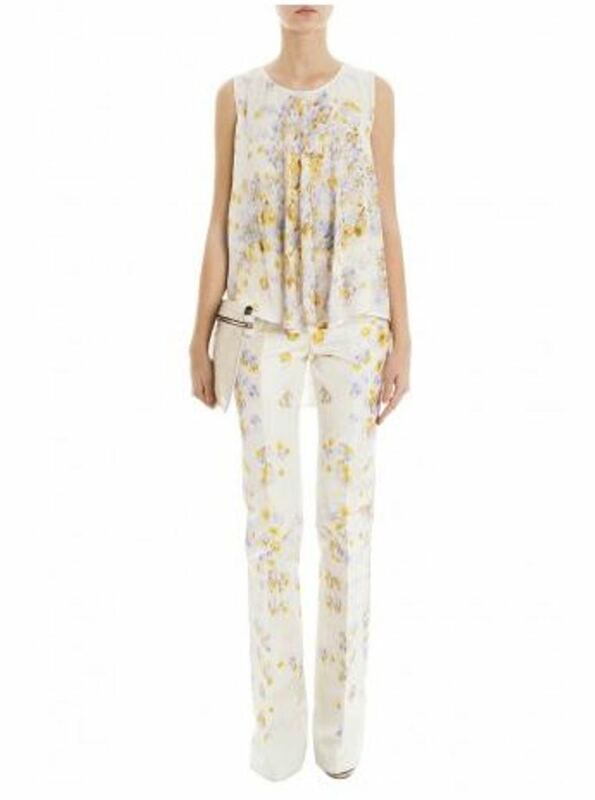 Like the pairing of the Valli top with the cropped jeans. A nice relaxed look. I disagree about the earrings – I think they look ridiculous, and painful. 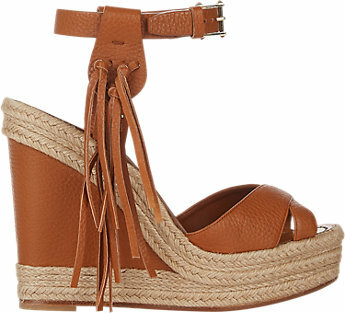 And the very short crop jeans and high platforms are out of proportion. She always looks beautiful – face, hair, smile, and in this case the beautiful top – but sometimes there is a false fashion note or two. My husband and I were once very close friends with a major movie star and his wife ( who both sadly have passed on), but we were able to witness the amazing amount of merchandise they were sent for free: cars, TVs, every kind of new gadget, and clothes, handbags, accessories, toiletries, vouchers, free hotel stays, spa treatments, security, chauffeured transport, etc. etc. 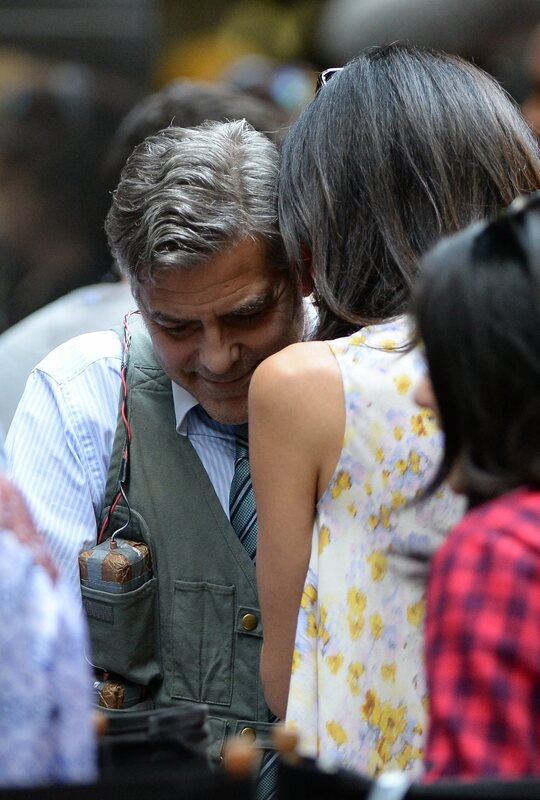 So there is no doubt in my mind that much of what Amal is wearing has been gifted to her. The value of the exposure and publicity alone is a manufacturer’s and vendor’s dream come true! But why do the celebrities succumb to this and accept the gifts when they have so much already? I don’t understand this part. Your kidding me right? Like no other race knows how to dress? Nati, you don’t publish intelligent comments and you publish this racist rubbish? I said this before and I’ll say it again. what I love and find very interesting and refreshing about Amal is the fact that she didn’t adapt an image that is not hers. she didn’t let the pr people carve the expected image of a lawyer out of her. Instead Amal kept her fun, outgoing, and colorful personality and style. do i prefer her in clean cut classic professional outfits? Yes! but that’s not who she is. I think some people, including me, were shocked by her because when we see her, it’s not what we imagine when we think of a lawyer. some even thought she’s a fame thirsty woman. However, Amal is just being herself and staying true to who see is, whether people like it or not. She oozes confidence and spontaneity and doesn’t go around trying to please anyone. She seems like one of those people who expect others to either accept them or get out of their way! Even George seems less controlling and more accepting in her presence. And I agree with you Soos, this outfit is giving me Lebanese vibes. The big statement earnings with a light casual outfit, the light wash (somewhat ill-fitting) capri jeans with chunky wedges, the sunglasses on the head, the thick and voluminous black hair, and most importantly, the confident smile with such a laid-back outfit is totally a Lebanese thing! Fabulous! Again a very attainable look and one easy produced on a smaller budget. And Amal is looking much more relaxed in the last two posts. I love the way George is looking at her. Helen- yes I too thought it was such a look of love when he looks at her! I love watching these two together! I’m thinking the jeans are Citizens of Humanity “Rocket” High Rise Crop in cinder. Citizens of Humanity “Rocket” High Rise SKINNY crop in Cinder. In a recent article I read on her style it says she doesn’t have a stylist she chooses her clothing herself. Whether they are free or not I don’t know but she can afford anything she wants I have also heard she gets a very generous allowance from her husband. How much for her top?????? That’s an insane amount just for a label. Love, love, love this outfit. Sieht super aus, sehr gute Kombination. Dezentere Farben bringen ihre Schönheit viel mehr zur Geltung. 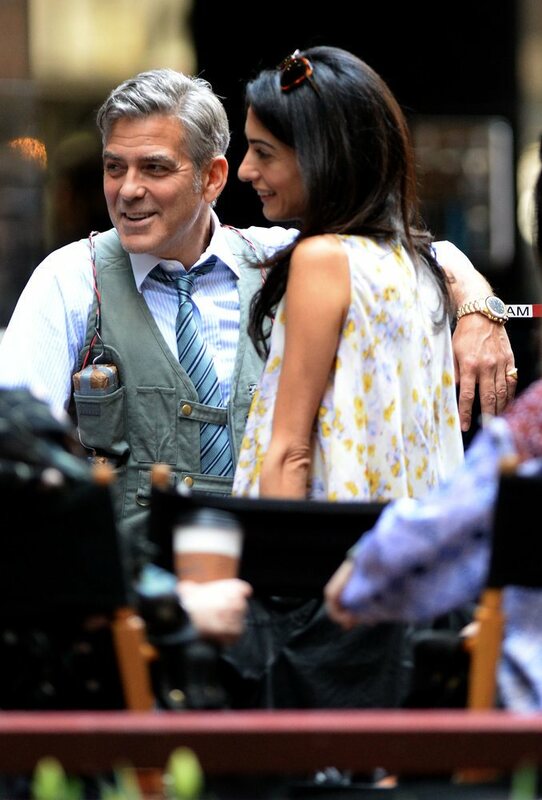 I believe I saw Amal wearing the matching trousers for the blouse in an earlier photo (23 Feb approx?) where she and George are at some event and shaking hands with Steven Spielberg. This is a great outfit! Any idea on the denim crops? Love the top, the shoes and the earrings are beautiful (but they look heavy and would stretch my earlobes so I’d never wear them unless they were clips.). I’d wear that top, the crops, and the sandals!! Amal looks fantastic in this ensemble. Maybe a few pictures that you don’t have? she is definitely spontaneous in these pics….adjusting jeans, pda with hubby, and seeming relaxed and having a fun flowery time. 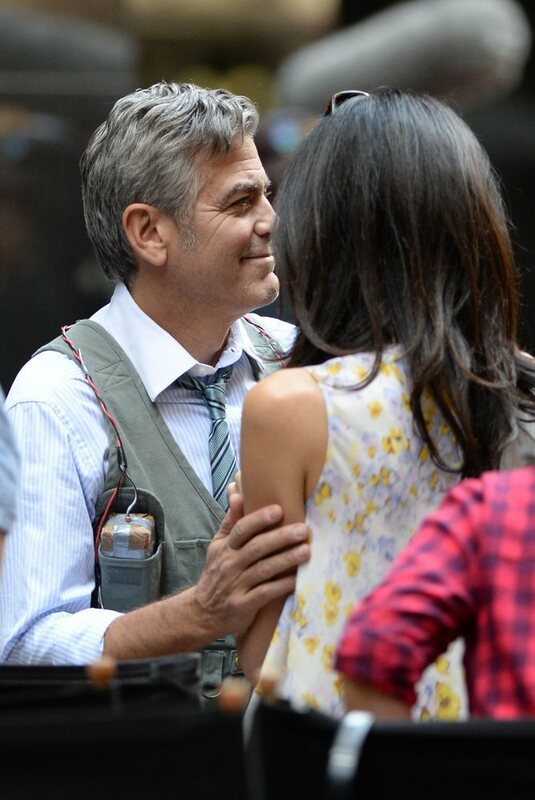 The way George looks at her is PRICELESS!!! haaa love!! This is costing George 10,000 a day on clothes. This look is 5000 dollars? Not necessary. If she were really chic she could have done this look for 300. Still she does look fresh and pretty and in love. However the chic is being clever with clothes not bankrupting George. She could wear things twice too like the royals do. George don’t pay her clothes. She is an indipendent woman. But, I agree with the point that she could be also gorgeous with a Zara top or a H&M dress. 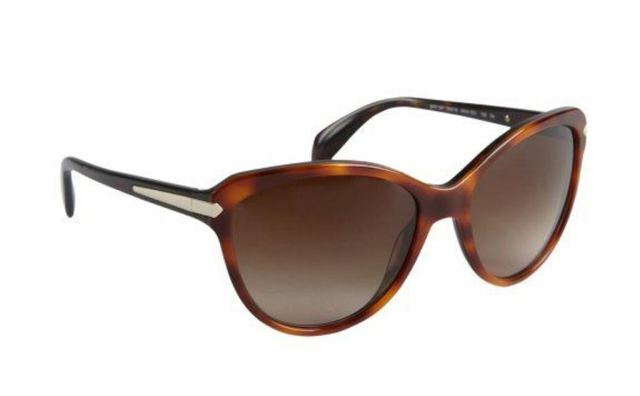 heck i can pull of this look with $100…the look… i said… not the quality though:) But for sure nobody needs to spend this much for such a simplistic look. Now, i doubt that she is paying for ANY of it. It is already a fact that she receives loads of stuff sent to her to wear. I would wear them too – minus the fur and animal skin ones – But perhaps if she wanted to be more more broadly loved and accepted she could wear some non expensive designer clothing as well. 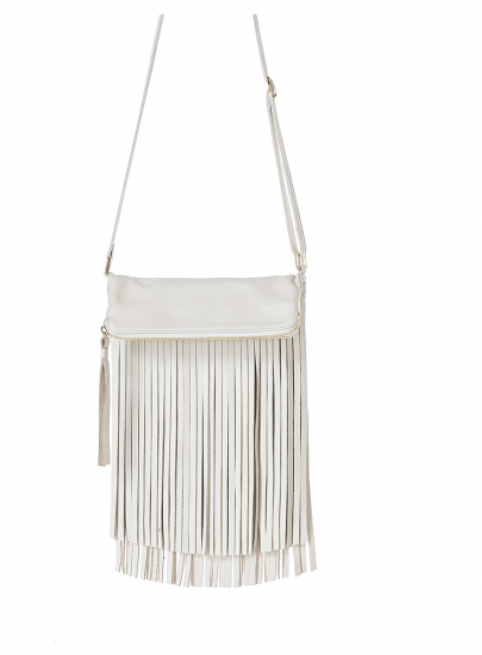 No need to make every outfit a designer catwalk display. This is how she gets great hair. Not true. 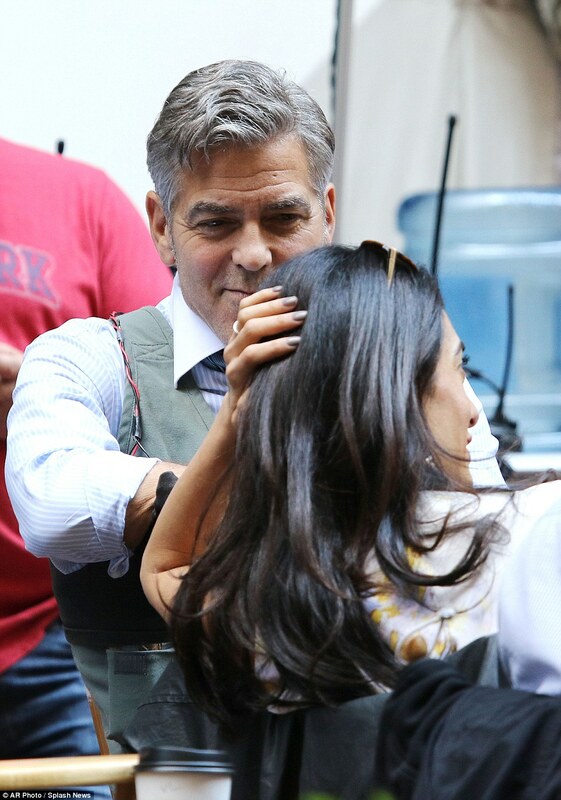 Max Coles started doing Amal’s hair at the recommendation of Anna Wintour AFTER she started dating George. He said as much himself in an interview. In this November, 2014 interview, he said that AW recommended him to AC about a year earlier. Maybe they got the IDs from you as they don’t have the April 16th shoes either. They steal everything and not a mention for our website. They never published my comments when I tried to mention our blog. But they publish the hateful comments against Amal. Rubbish paper as George Clooney said. scumbags! They feed from haters negativity, dont let them get to your best Nati. The best people will come here to your blog anyways, and your blog got mentioned by a much more important newspaper than DM!! I think I have the proof. Their ID about the April 16th outfit is a ‘tweed pencil dress’ as the photograph you put on your blog as example of same collection. But clearly it’s a jacket and skirt with a white top. they never moderate articles about George and Amal and they clearly state that on top of the comment section. I think that they don’t moderate them to allow obvious haters and trolls to write ignorant, false, sexist, and purely hateful comments about Amal. but then if they never published your comment Nati, it means that they do indeed manipulate the comments, even when they state otherwise. I knew there’s something wrong going on because it’s just not possible for even a slightly positive comment about Amal to get hundreds of red arrows and a comment directly under it to get very few votes. it’s as if someone is continuously red-voting the positive comments and leaving the rest of the comments alone. Also I saw the time of few comments change when I click the “view all” button. In fact, I saw a comment jump from 3 mins to 14 mins in seconds! Yeah that’s not to mention the garbage that their “journalists” write. Nati, I read through some of the comments – lots of people actually refer to your blog in the comments section though they don’t give a direct link – one comment said the blog was under Amal Alamuddin and WordPress. Don’t worry, it’s easy to locate your blog and make the connection. I think people are reading this and know DM is getting its info from you. Now to be fair though – Amal has done this to herself. It is very hard for normal people to relate to her when she focuses so much on her appearance. It is not jealousy that drives people to be angry or suspicious of her – it is her flaunting her wealth and excessive lifestyle that the common person finds hard to assimilate with the “human rights” bit. There are inconsistencies, there is a huge PR element and she and George know this – I don’t think all the people criticising her are ‘haters’, they are just pointing out her image is not one of a supporter of justice and charity – it is an image of conspicuous consumption, self aggrandisement and excess. 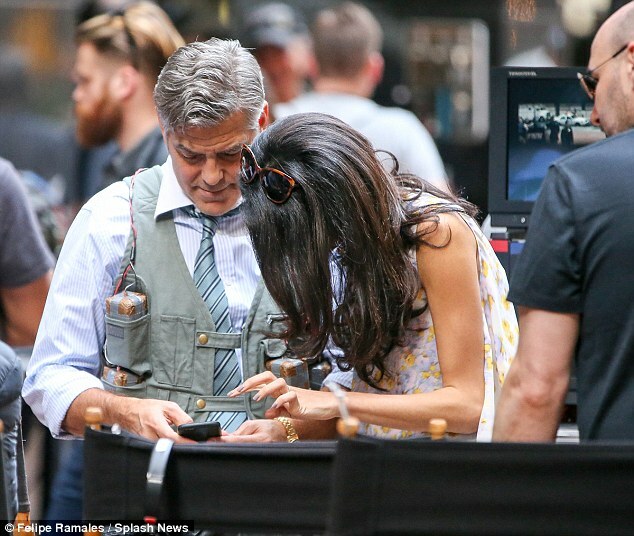 That is Amal’s doing and commenting on it does not make people ‘jealous’ or a ‘hater’. It in fact makes people sensible observers and analysts. There is the other problem of the overinflated CV that is up on Wikipedia and on her website. People don’t like feeling duped. If she toned it down, people would warm to her more. I get the feeling that most of us on this website are Middle Eastern women, around her age or older, probably a high proportion of us are Lebanese, and so we are very very proud of her. We are patriotic to those we call our own. But we must not be blinded by what the rest of the world can see. We also probably fit into the middle class demographic and have the luxury of talking about clothes – the majority of the world cannot do this. Criticising Amal and her choices is not ‘hate’ or ‘jealousy’ driven always. Agreed. A note on the over-inflated CV – all barristers do that. They are self-employed after all. But it’s easy to spot when it is hyped and when it is real. Amal has a very standard education in terms of the London bar, and there are many who are much better educated than her. Her experience is also fairly average. It strikes me that she does not have much of a work ethic – many of her colleagues of similar call are doing much better in terms of the volume and variety of work they are doing. Not that it looks like she cares! The media make her out to the be the preeminent lawyer of all lawyers (probably fueled by the George Clooney press team)….but she is one of 91 junior counsels at a London law firm and was called to the Bar in 2010. She may or may not be a good lawyer (I’m guessing that she is good as I’m assuming all the lawyers at that firm are good). Probably the only ones who can honestly answer that question are the people she worked with before she got famous. Now, the law firm is also benefiting from her fame so it’s win-win for everyone. I suspect that she is working only specific cases that the firm want her name associated with and/or ones that she has a specific interest in….gives the case more publicity/attention. I would imagine that she has a lot of leeway with regards to work. The law firm does not want to lose her (due to publicity) and she appears to want to enjoy her new married life (and who could blame her). Obviously, she is only one of a team of lawyers on each case so she may/may not have much to actually prepare for the cases. So, she gets to keep her toe in the water but can be very flexible with her time/work load. Again, win-win for everyone. First, the fact that Amal is Arabic means nothing to me. If anything, I feel slightly ashamed of Arabs because they are good at nothing except killing each other. And if they’re not killing each other, then they are wasting their time smoking a type of tobacco that’s 100x more cancerous than cigarettes. Then they stand up and wonder why they’re not progressing. Also, the fact that Amal is Lebanese doesn’t create a connection strong enough for me to feel a sense of belonging to her, and thus any pride towards her. I don’t necessarily feel “proud” of Amal. I feel happy that a fellow woman is educated and accomplished, even if her accomplishments means nothing to you. But if I have to explain my interest in her, I’ll say that: I admire her job, I admire her education, and I wouldn’t mind her wardrobe, her hair, and her rich husband. With all this said, lets not forget that there’s a chance that Amal might consider herself English, not Lebanese. After all, she grew up in Britain, and that perfectly fine. As for the “haters” part. I really don’t care if others didn’t like Amal’s socks. After all, each one has a different taste. What really bothers me are those few people that go from one site to another to insult Amal because her husband is liberal, she is from Arabic and Muslim descent, she doesn’t fit their standard of beauty, and because she believes Gaza is occupied. they even created a biased blog and keep promoting it at the Daily Mail. 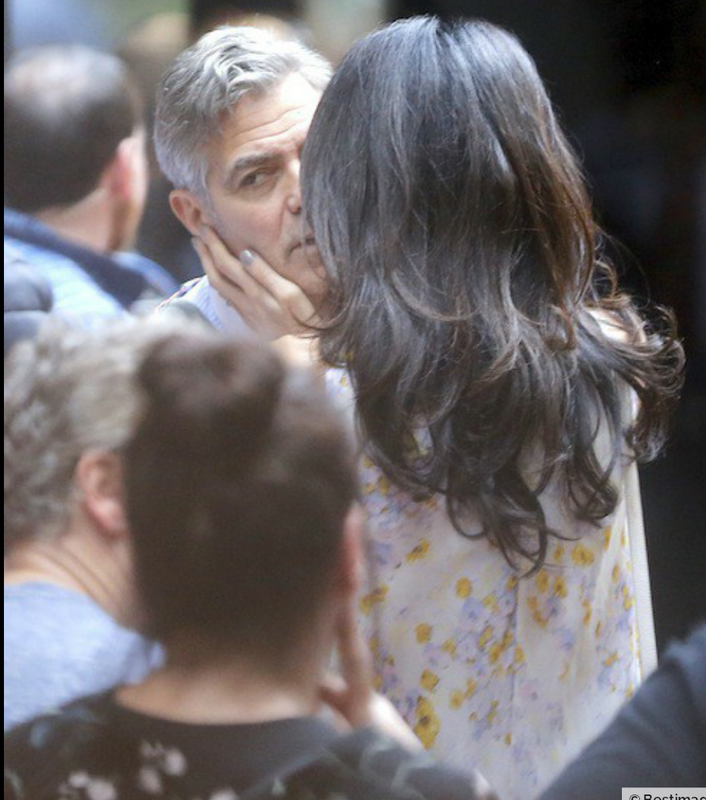 There are other “haters” who consider themselves to be George Clooney’s fans and simply bash Amal because she’s his wife (every celebrity has the latter kind of “fans”). You nailed it with your comment! Brava. I find her friend and colleague Jennifer Robinson far more impressive and credible as a lawyer (check Wiki/Google), but she is not striking and far less stylish … but I like her too. I am definitely 100% ABSOLUTELY overwhelmingly COMPLETELY in support of your views Kalinka (are you Australian or from NZ??!!!). WOW!! Someone else that knows about Jennifer Robinson!!! Amal is not in the same league as Jennifer Robinson I’m afraid. Jennifer is in a league of her own. Amal and Jennifer are both lawyers, but the similarity ends there. Their backgrounds, characters, values, cases and work ethic are diametrically different. Jennifer is younger, but far far far more experienced. She works pro bono, is not publicity seeking and is astoundingly intelligent. Stunningly beautiful and stylish too – with wrinkles and a face that speaks of kindness, compassion, knowledge and wisdom despite her young years. She is, above all of her achievements, Director of the Bertha Foundation. Nosirree, I’m afraid Amal just isn’t in her league. And no, I’m not related to her. And I don’t know her at all, but we in the Southern Hemisphere are very aware of the human rights issues affecting our neighbouring countries an their advocates (yep, I’m talking SEAsia….. from where pythons are slaughtered for Amal to wear around her neck…don’t get me started…!). JON321, I am European, but I know about Jennifer Robinson because I am interested in justice and human right activists/defenders. Agree with you 100% on Jennifer. From Wiki, on Jennifer Robinson: journalist Eric Ellis called her “an eloquent activist for the world’s downtrodden and disenfranchised” (Wiki). That is exactly what I sense looking at her pictures and reading articles about her work. Thanks for the video URL, I have already watched it before. By looking at her pictures and video, you can tell Jennifer is a very hard working woman, very much dedicated to her work (her mission in life? ), she has no time nor energy to do much styling, despite obviously liking nice clothes, she is stylish in her own way. She is not a Vogue beauty, wrinkles are not botoxed, but still good looking and has the glow from inside out of a woman who is dedicated to a great cause – I feel inspired just from looking at her. Also she seems to be a very nice character. 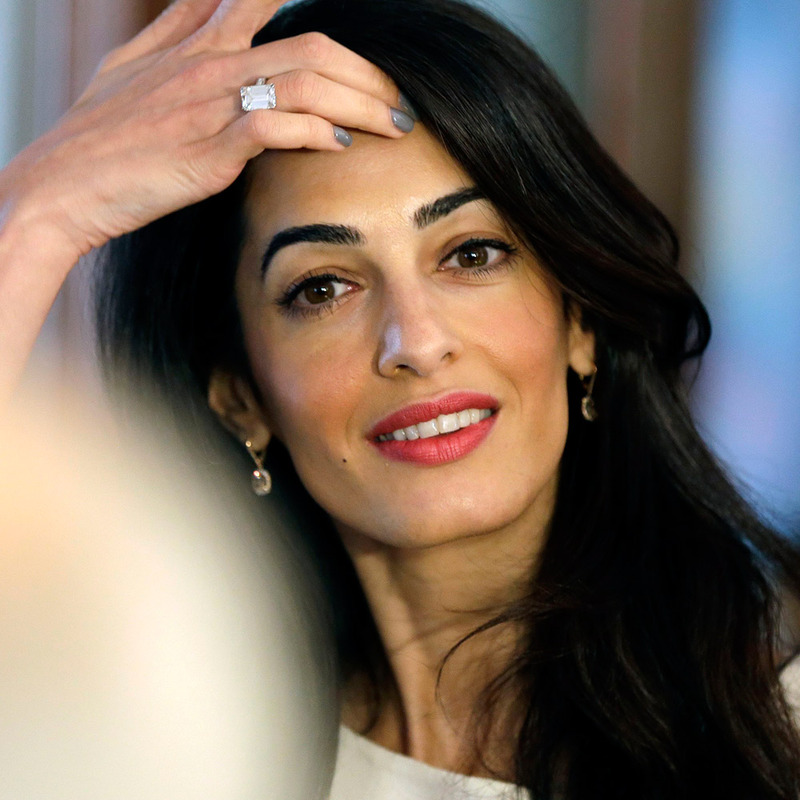 As a lawyer, she seems to be already very successful, although still young, younger than Amal. Again, I agree with you 100% on Jennifer. Amal has a strong presence, what French call “je ne sais quoi”, striking good looks, and since being with George her looks are enhanced by high fashion, beauty treatments of all kind, also a natural talent for posing like a high fashion model, what makes her perfect for paparazzi and high fashion magazines … especially for Vogue. In her pre-George style she was not more stylish than Jennifer – look at the pictures with Assange – Amal is pretty but not really as striking as she is now, nor her clothes. She clearly loves fashion, now she has the money for high fashion, and she is surely getting some good advises from Anna Wintour … and some clothe gifts too from designers. 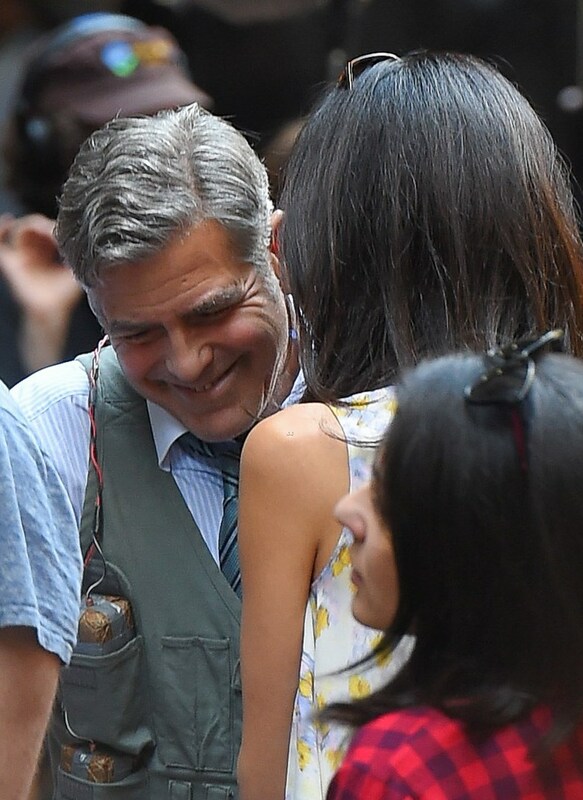 I find Amal fun to look at, she is interesting, somehow intriguing, her appearances are like a show, a “real life” catwalk, and together with George the whole thing is an amusing soap opera … a fun guessing game too what is coming next … A baby? Divorce? A change of style? A new case? Some drama? If I have to choose between meeting and getting to know Amal or Jennifer, I would choose the latter – I would have much to discuss with her on justice, human rights, her cases etc. I love beautiful clothes, but I don´t take fashion too seriously – my life is not about fashion first. I have read often, that Amal is a good role model for young women – I disagree strongly! If I have to choose a role model for me, I would prefer Jennifer Robinson, Marissa Mayer, Sheryl Sandberg or Elisabeth Holmes – all of them good looking, stylish in their own very personal way, but most important: highly dedicated to their work and quite successful too! Spot on Kalinka. 500% right behind you there. All of your comments are so accurate. 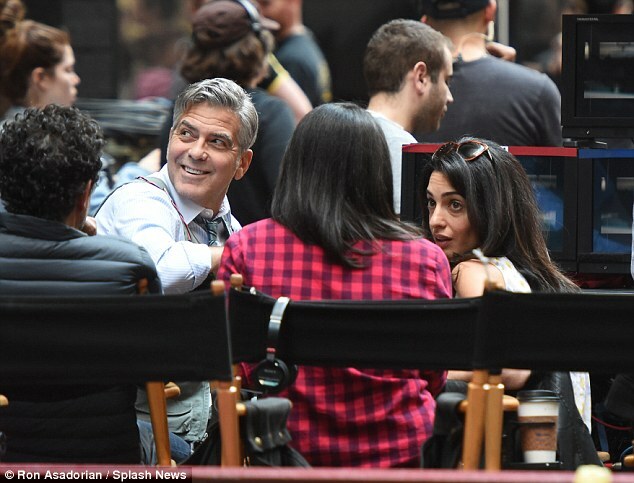 I agree with your observations about how Amal’s facial appearance has been modified and enhanced. It’s no longer natural. Amal is a pleasant ‘show’, and it’s fun following her clothes – but it is very hard for me to take her seriously as a lawyer now. Agree with you also, given the chance to meet either of them, Jennifer wins by a long shot. The comments and praises heaped upon Jennifer also sound genuine and authentic, and do not carry the same superfluous grandeur that typically accompanies articles describing Amal’s career. 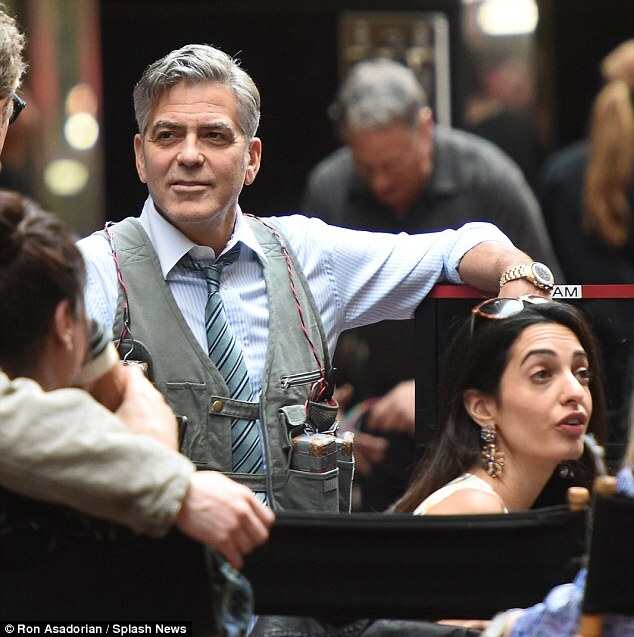 Again, I do believe Amal falling out of favour with the common people is all her own doing – I think the PR machine is in overload and George and Amal are simply out of touch with the common people who feel they are being ‘sold’ something. Nati – I’m getting in early before you again ask me if I dislike her! No I don’t dislike her. I enjoy her fashion. I like watching the G and A performance – it is opposite to anything I expected it to be! Like a sophisticated version of the Kardashians. I simply don’t admire her as a lawyer and cannot reconcile the images of ripped jeans, snake outfits, short skirts, thousand dollar outfits, with my probably traditional expectations of an intelligent woman. And Nati, I do thank you for the opportunity to converse with some amazing minds through your blog, made more special by the fact we are on opposite ends of the world but enjoying the same spectacle. Cute top. The earrings look very heavy, and they’re stretching her earlobes. I wish George would take her out for a big lunch. She looks healthier in dress pants and dresses, but in jeans, she looks emaciated to me. I also noted her pulled earlobes…she needs to stop wearing earrings that do that or even lighter weight ones will do it to her in about 10 years. Also agree with the comment from another poster that this look can be pulled off for much less…probably $200 or so. job. He is so rich, perhaps he encourages her in buying clothes or whatever she wants. They do not have any children and so not that responsibility like we “normal” people have. Baria’s, (her mother), earlobes are pretty long and looked pulled from prolonged heavy earring wearing too. If she has bunions, it’s no great mystery why. All those super-high heels put an awful lot of pressure on those bones in the ball of her feet. 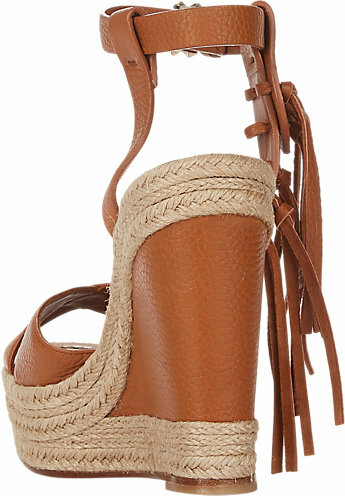 She would look great in any kind of shoe, so I don’t understand why she almost always wears such high heels. Other than the shoes and the price tags, I’m really enjoying her work and casual clothes lately. I think she has hammertoes. The photos of her wearing flip flops in London before her marriage show that her feet have suffered from all those high heeled pointy shoes. She is so tall anyway that, as Janet says, she can wear whatever shoes she likes. That is what wearing pointing shoes does!! I can’t stand pointing shoes on my feet, they are so painful !! :(( But some ladies love that, but for sure it deforms the feet. your blog has been already mentioned positively in our magazines. So in Germany you are well known and people prefer to inform themselves in your blog than in these cheap, partly lying tabloids. It ist annoying that in our German medias every single week a new “marriage problem” between Amal and George Clooney is inventend. Yesterday e.g. they wrote, that she would visit him at the set of Money Monsters in order to “mark her territory” Translation: ihr Revier abstsecken. Normally dogs do that in our language.The reason was, they wrote, jealousy, because “Julia Roberts” embraced him at first. Hopefully you understand my english. Sorry. I hate to sound negative here, but I have to say that this outfit does absolutely nothing for me (which is why I didn’t write anything about it before). It looks good on her, but there’s nothing really special about it. As people here have pointed out, the same look can be achieved for much lower cost and the big earrings pull at her ear lobes way too much. Not a fan of skinny jeans, nor capri-cut pants on anyone. 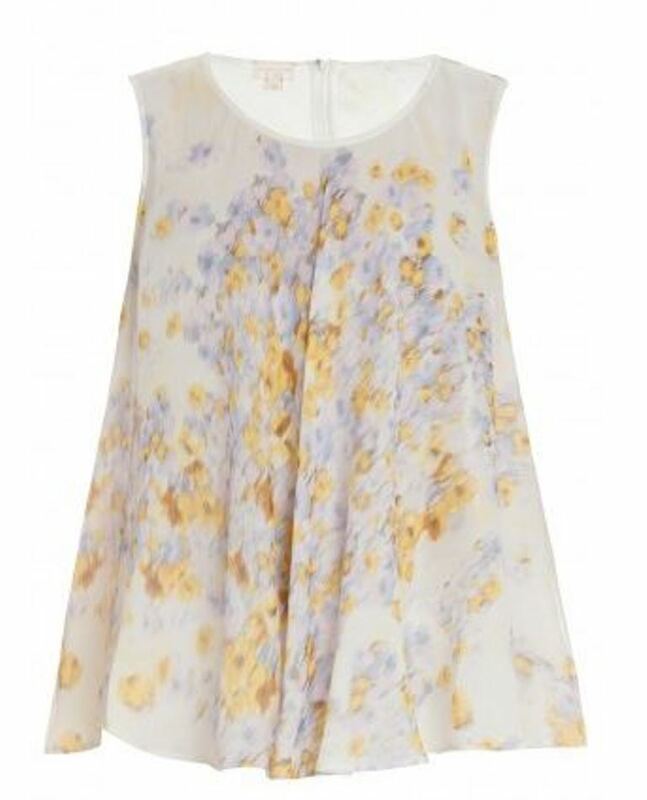 The top has a lovely print, but the cut makes it look like maternity wear. 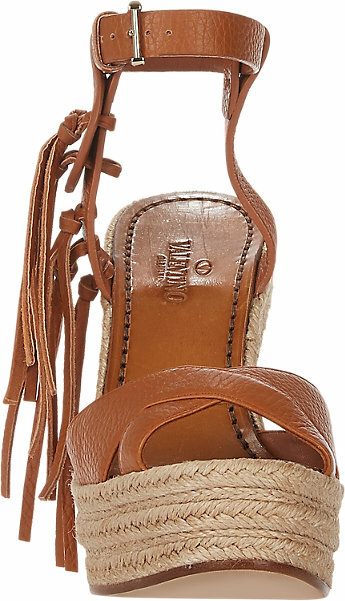 The wedge shoes look like cheap sweatshop produced shoes that Banana Republic was selling years ago. Sorry, but this outfit just makes her look like a typical Manhattan trophy wife clothes-horse out for a day of shopping and salons. Again, she’s beautiful, but the outfit scores a 0 out of 10 for me. I should also state that the above comment I made was really geared toward the designers of the clothing in that outfit, more than it was toward Amal. Seriously, the thoughts that came to my mind as I looked at these photos were 1.) the expression “barefoot and pregnant” and 2.) 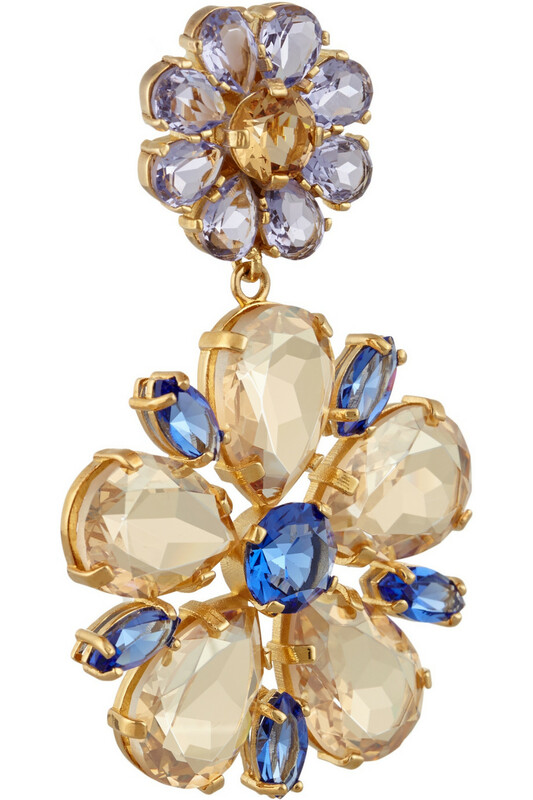 that the large earrings looked like they belonged on a Christmas tree as ornaments. Maybe I’m too much of a feminist for this look. It irritated me, though. Guys, back in February Amal published a letter in the Huffington Post where she said she was planning to go to Egypt to free the Canadian journalist – and George made a big deal out of it in an interview when he was attending a charity event (it was very distasteful and unprofessional of him to discuss his wife’s case in that manner BTW) – does anyone know if she went or what happened to that case? It received so much publicity at the time – but it then seemed to fizzle. Thanks. She didn’t go to Egypt finally. Mohammed Fahny received today his new canadian passport. Her going to Egypt would not have made an ounce of difference. There is no real rule of law in Egypt, in the sense that there is no meaningful independence between the judiciary and the executive. There is no way to legally challenge from within, she simply could not have done it. As for challenging from without – the west is largely supportive of the regime in Egypt, at least in comparison to the Muslim Brotherhood, so she would have hit a brick wall even trying to bring any kind of international proceedings against a sovereign government. That was just a case of high-profile campaigning for the family (she would never have got the case without being married to Clooney because the media attention is what the family desperately needed), nothing legal there. And nothing strictly wrong with it either, but I personally think it is a shame if that’s all she does with her legal career! And the granting of the passport has more to do with politics than anything legal. Please don’t take this as any criticism of Amal, it is not – just trying to inject some reality into the discussion! Interesting news Nati! I was wondering how come no more reports on her job?? So did she finally freed the guy?? i wonder if she got pressured by her PR firm to stop making too much publicity of her cases? I think it only helped them though. I wish we would continue to see reports on her job on the media, instead of just her outings for diner. Thanks Nati. I read the same. 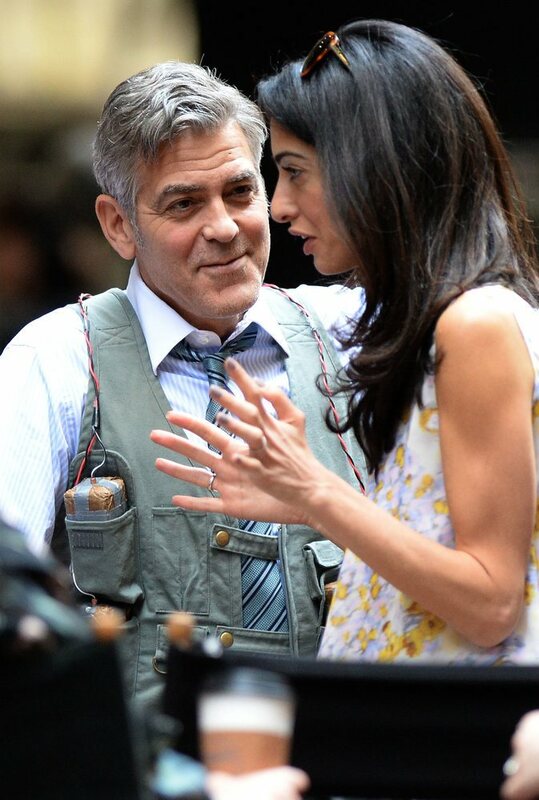 I was disappointed not to hear more especially after all the publicity Amal created with her letter in the HPost and the way George referred to her working on it (again, soooo inappropriate for a spouse to discuss cases publicly – he really is big on inflating his reputation). It seems it was just legal rhetoric and the Canadian govt sorted it for Fahdy. Thank you ESR. Please keep injecting reality into this blog. I’m loving your comments! 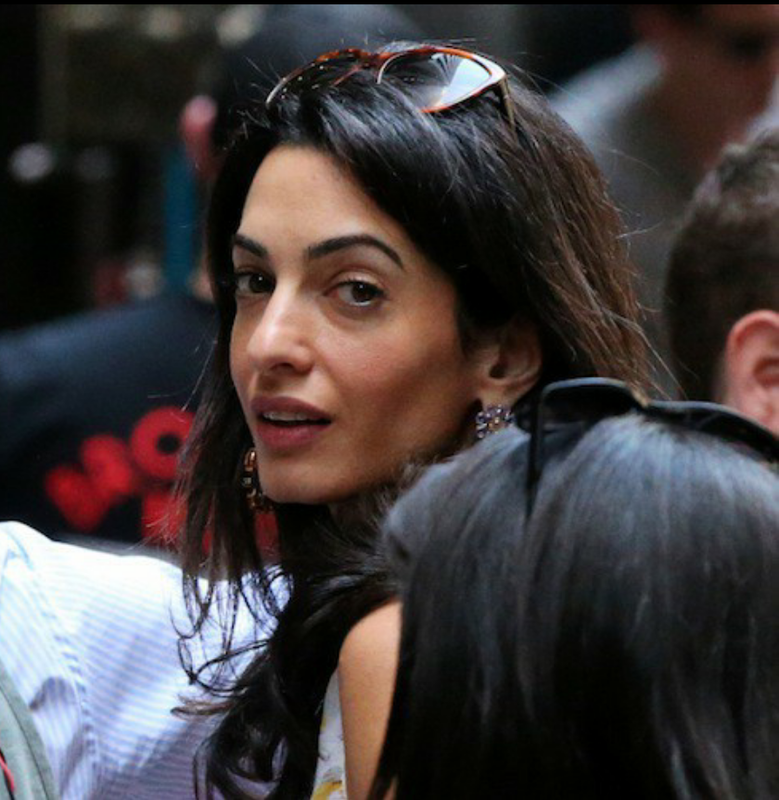 With very few exceptions, the coverage of Amal in the press, even the New York Times, is such fawning piffle. Whether what she is wearing is flattering or not, no matter if it is made out of some tortured animal or costs more than most families make in a month, it is all such breathless, mindless hype. The big exception is this blog. I find it so refreshing to read everyone’s comments — sensible, principled and fun. Such a breath of fresh air! She and George dined with Julia Roberts. There is a new photo of them. She is quite covered up. A little perspective would be nice. As per earlier comments, everyone is entitled to have an opinion on someone who has made herself a very public target for comment without accusations of trolling or jealousy. I’m sure she’s a perfectly nice, decent woman but – for me – she’s lost the quirk – style-wise – that really attracted me to her when she first ‘appeared’. Frankly, I blame Clooney. It seems to be his ego that directs this. She’s a consenting intelligent adult. They are both to blame for the disillusionment they are causing with their PR image. Note, no photos of Julia at the dinner. There is a way to avoid the paps but George’s relationship with them is very cordial and friendly. He invites them into his life. Julia puts the paps in their place and has clearly told them in the past to leave her and her family alone. There is a way to manage fame. G and A are not endearing themselves to the public with their chosen path. It is too showy and laden with privilege. The fawning someone mentioned above is not the media’s doing alone. 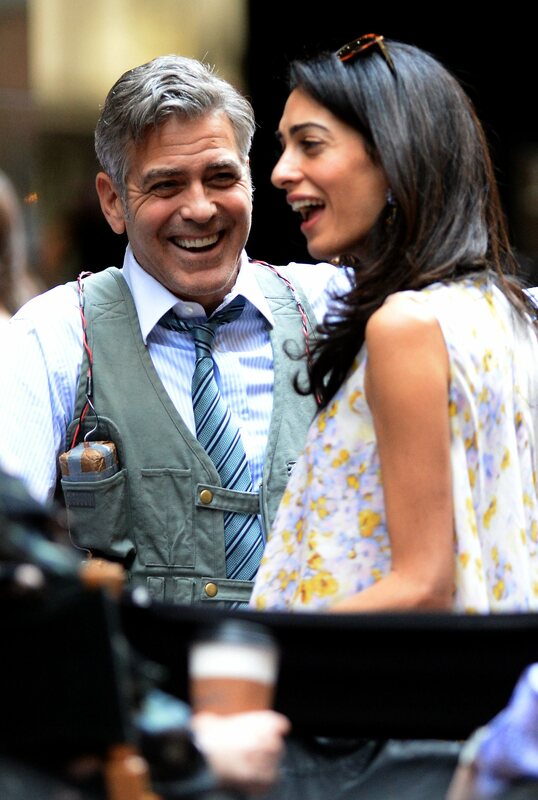 It’s been mentioned before in here – it’s a symbiotic relationship they have with the paps – Amal needs them in order to keep receiving designer clothes. It’s as simple as that. They are both using each other. For normal people, it’s distasteful – for me, I’ve stopped worrying about it. I just look at her for her clothes! She stopped being a role model a long time ago for me. I just wish I could turn my thinking brain off when I look at her as sometimes the negative thoughts I have about her publicity seeking behaviours interfere with my enjoyment of her fashion! If Amal is only average I’m sure there are many who would love be as average when it comes to education and her career. Please read my post more carefully – I said she was average amongst the London Bar. Of course the Bar demands high standards, but hers are not the highest. All I was doing is contextualising her achievements because she is often heralded to dizzying heights. aw, I think ESR meant average within her profession. Please relax a little on your perceived criticisms of Amal aw, it’s really getting tiresome. I think we all agree Amal is in a select and elite group of human beings who is extraordinarily lucky and privileged and has had opportunities provided to her that are beyond average “when it comes to education and career”. Just read what people say carefully before you jump to the defence. It’s only since he married Amal has he been so photographed. He was never a media hound before this. I think he is proud of her and wants to show her off. I think it’s kinda sweet. I think we all agree she has that ‘it’ quality about her – brains, looks, style and a bit illusive. She’s the women that landed the most famous bachelor in the world. Of course people want to see her – to figure out ‘why her’. Jon 321 — Agree with your earlier post. re: G&A courting the paps/ trying to create a particular image. The wedding was her ‘coming out party’….her ‘débutante ball’ …so to speak. She was put on display there (and in selling the pictures to the magazine) to create interest, elevate her status, and put/introduce her into the public eye. Think of the major actors who have had quiet weddings…not wanting to create a press frenzy (Brad Pitt, Julia Roberts… to name only two). G&A created a complete press hysteria!! PS….Jon321 – I really like a lot of your comments. Very intelligent. Thank you Italian Bird. Likewise. I published her comments but lately. I was quite busy with my job and family in the last days. There’s a lot of publicity for this film. Is it being filmed openly in the streets of NY – how are so many paps getting access? Is Sony producing it maybe? Is this part of George getting the ‘protection’ he requested from all his bad reviews? I’m a little confused with what’s going on here. After the Sony hack of his emails, I saw GC in a very different light – the outright request to manipulate his ratings and popularity and the request to make him ‘a success’ followed by the discussion that ensued between Amy and George to ‘make money as revenge’ made for very uncomfortable reading. And who owns ‘Smoke House Pictures’ you ask? Why, none other than George Clooney and Grant Heslov (both in this video). Hhhmmm, I wonder why/how there is so much access to photographers?